These Polypropylene Butterfly Swords blend modern technology with classic design to create attractive and durable training blades. An excellent choice for martial arts, these sparring swords are suitable for full contact combat. Sold as a pair, each single edged blade is decorated with a scalloped hamon line and a fuller, with small dragons dancing between the two borders. The D shaped guard features a long forward quillon that can be used to trap or deflect an opposing weapon. The handle is ridged for a secure grip. 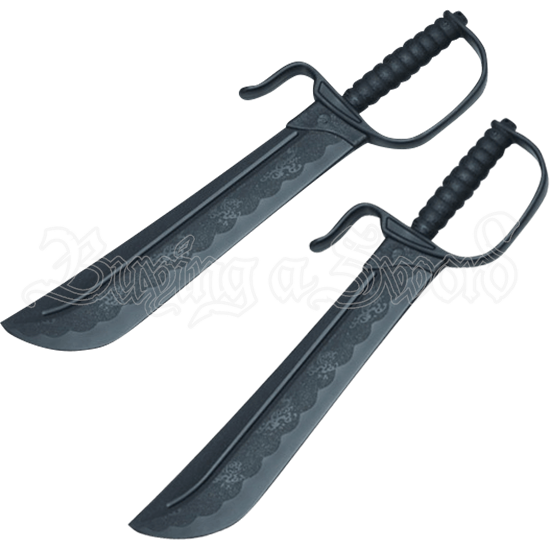 A sturdy choice for simulated combat, the Polypropylene Butterfly Swords also make exemplary props for cosplay conventions, Halloween parties, and reenactment events.